Observations by NASA’s Curiosity Rover indicate Mars’ Mount Sharp was built by sediments deposited in a large lake bed over tens of millions of years. This interpretation of Curiosity’s finds in Gale Crater suggests ancient Mars maintained a climate that could have produced long-lasting lakes at many locations on the Red Planet. Why this layered mountain sits in a crater has been a challenging question for researchers. Mount Sharp stands about 3 miles (5 kilometers) tall, its lower flanks exposing hundreds of rock layers. 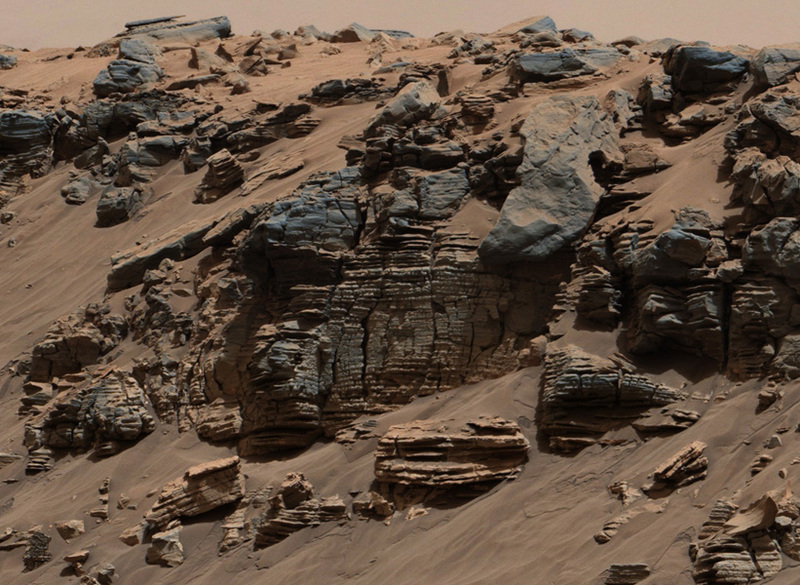 The rock layers – alternating between lake, river and wind deposits — bear witness to the repeated filling and evaporation of a Martian lake much larger and longer-lasting than any previously examined close-up. Curiosity currently is investigating the lowest sedimentary layers of Mount Sharp, a section of rock 500 feet (150 meters) high, dubbed the Murray formation. Rivers carried sand and silt to the lake, depositing the sediments at the mouth of the river to form deltas similar to those found at river mouths on Earth. This cycle occurred over and over again. After the crater filled to a height of at least a few hundred yards, or meters, and the sediments hardened into rock, the accumulated layers of sediment were sculpted over time into a mountainous shape by wind erosion that carved away the material between the crater perimeter and what is now the edge of the mountain. On the 5-mile (8-kilometer) journey from Curiosity’s 2012 landing site to its current work site at the base of Mount Sharp, the rover uncovered clues about the changing shape of the crater floor during the era of lakes. Despite earlier evidence from several Mars missions that pointed to wet environments on ancient Mars, modeling of the ancient climate has yet to identify the conditions that could have produced long periods warm enough for stable water on the surface. NASA’s Mars Science Laboratory Project uses Curiosity to assess ancient, potentially habitable environments and the significant changes the Martian environment has experienced over millions of years. This project is one element of NASA’s ongoing Mars research and preparation for a human mission to the planet in the 2030s. “Knowledge we’re gaining about Mars’ environmental evolution by deciphering how Mount Sharp formed will also help guide plans for future missions to seek signs of Martian life,” said Michael Meyer, lead scientist for NASA’s Mars Exploration Program at the agency’s headquarters in Washington.